Originally published as A Time to Sow. This is also Intimate Novel #28. This is also Quarter Books #56. This is also Intimate Novel #18. This is also Venus Books #137. This is also Venus Books #192. This is also Intimate Novel #34. This is also Intimate Novel #29. This is also Intimate Novel #9. This is also Quarter Books #52. 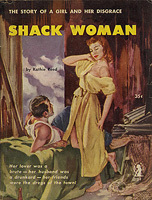 Originally published as Three Lovers. This is also Quarter Books #55. Originally published as Wedding Night. This is also Cameo Books #317.